Ventura Publisher was the first popular desktop publishing package for IBM PC compatible computers running the GEM extension to the DOS operating system. The software was originally developed by Ventura Software, a small software company founded by John Meyer, Don Heiskel, and Lee Jay Lorenzen, all of whom met while working at Digital Research. It ran under an included run-time copy of Digital Research, Inc.'s Graphical Environment Manager (GEM). 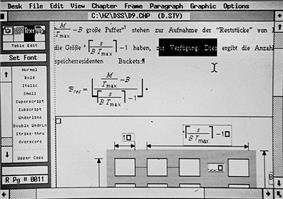 The first version of Ventura Publisher was released in 1986. Ventura Publisher was distributed worldwide exclusively by Xerox from its first shipment in 1986 until Ventura Software sold the source code to Xerox in 1990. The original Ventura Software ceased operations in February 1990, and a new Ventura Software Inc. was formed at that time, an affiliated company of Xerox. The developers from the original company worked with the new Xerox Ventura Software company to produce Version 3.0 Gold. This was released in late 1990. Besides DOS/GEM, it was also available for Win16, Mac, and OS/2. The three founders of the original Ventura Software no longer worked on the product after November 1990. Version 4.0 was released in 1991. The last version released by Ventura Software Inc. was 4.1.1 in 1993. Ventura Publisher had some text editing and line drawing capabilities of its own, but it was designed to interface with a wide variety of word processing and graphics programs rather than to supplant them. To that end, text was stored in, loaded from, and saved back to word processor files in the native formats of a variety of word processors, including WordPerfect, Wordstar, and early versions of Microsoft Word, rather than being incorporated into the chapter files. This allowed users to continue using their favorite word processors for major text changes, spelling checks, and so forth. Paragraphs other than default body text were tagged with descriptive tagnames that were entirely user-defined, and characters and attributes that have no native equivalent in a given word processor were represented with standardized sequences of characters. When working with the files outside of Ventura Publisher, these paragraph tags and special character and attribute codes could be freely changed, the same as any other text. These tags looked very much like HTML tags. Ventura Publisher was the first major typesetting program to incorporate the concept of an implicit "underlying page" frame, and one of the first to incorporate a strong "style sheet" concept. It produced documents with a high degree of internal consistency, unless specifically overridden by the user. Its concepts of free-flowing text, paragraph tagging, and codes for attributes and special characters anticipated similar concepts inherent in HTML and XML. Likewise, its concept of "publication" files that tie together "chapter" files gave it the ability to handle documents hundreds (or even thousands) of pages in length as easily as a four-page newsletter. Its ability to print to a wide variety of devices, including imagesetters, as well as certain popular dot-matrix printers. The application was acquired by Corel in 1993. It was repackaged and soon released as Corel Ventura 4.2 without any major change in the application, other than to drop all support for platforms other than Microsoft Windows. The first real Corel version was 5.0, released in 1994, and made fundamental changes to both user interface and document structure. Because of this, and because of escalating requirements of the various Corel versions, the original DOS/GEM edition still has a small number of die-hard users. The application was rewritten for the Win32 platform and was released in 1996, labeled Corel Ventura 7 (instead of 6) so that it would match the version number of CorelDRAW. Corel Ventura 8 was released in 1998. 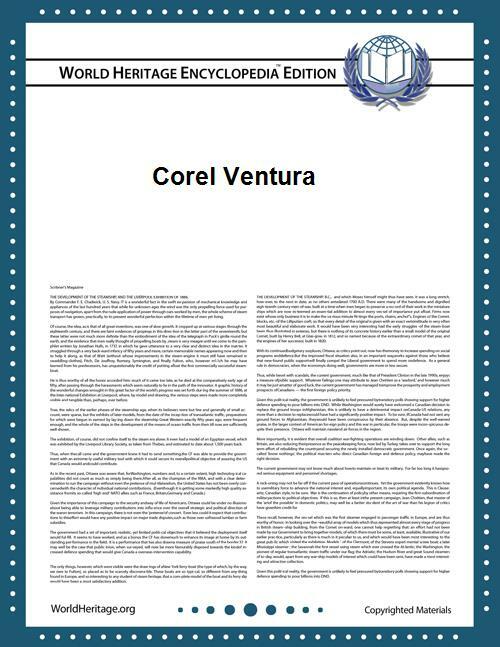 The latest version (as of June 2014) is Corel Ventura 10 (2002), this version runs in Windows 8.1 (x86/64) with compatibility mode (w2k) and copy "mfc42.dll" in programs corel folder. Also run over linux ubuntu 14.04 / wine, inclusive in live USB mode. As an application with strengths in more structured documents, its main competitors are FrameMaker, InDesign and QuarkXPress.